1801 house on Black Gates Rd. 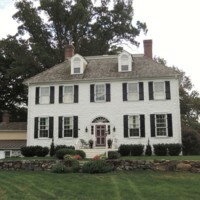 This house was built in 1801 by William Young, on Black Gates Rd. in Rockland. Today it is a private residence. Eliza West, Photo of William Young House, September 19th, 2017, property of the author. “William Young House,” DelaWARES.org, accessed April 23, 2019, http://delawares.org/items/show/120.